Everyone loves a mall pretzel. Unfortunately, you usually have to go to, uh, the mall to get one. Until now. 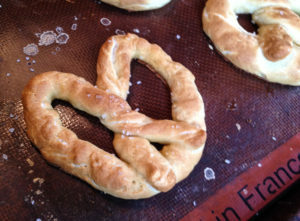 EveryFoodFits’ web designer extraordinaire, Rebecca, shared with me a mall pretzel recipe – and it’s so much easier than it sounds. I swear. I tweaked a few things here and there and tested the recipe many, many times, often scarfing down the resulting pretzels. I sacrifice so much for you, dear reader. Sprinkle yeast on lukewarm water in mixing bowl of stand mixer or large bowl, if kneading by hand; stir to dissolve. Once dough has neared the end of its rise, boil water and add to a glass 9x13" baking pan with baking soda. Stir to dissolve. This creates the baking soda bath that will make your pretzels come out of the oven golden brown. Roll dough into very, very thin ropes. The thinner the rope, the more like a mall pretzel it will come out. Shape pretzel and gently soak in baking soda bath for a few minutes. Remove from bath and gently shake off excess water. Place on parchment- or silicone mat-lined baking sheet. Bake in 450 degrees F oven for about 10 minutes or until golden. Brush with melted butter, add salt and enjoy! Don’t know how to shape a pretzel? Check out this tutorial on The Kitchn. These pretzels are healthier than one you can get at the mall. You control the ingredients that go into them, and you can add as much or as little butter and salt as you want. What’s the verdict? Would you rather make your own pretzels or buy one at the mall? Do you enjoy your pretzels savory or sweet?